Hey everyone, I am currently finishing up an update to DT3K to be released in the next few days! This update will mainly focus on the Career Mode, making the garage screen actually functional. You can buy upgrades with the money earned from fares, and damage to the car can also be repaired with money. Prices are still being balanced out and you will start with enough money for at least one upgrade level, which you will be able to choose between turbo, tires, brakes and cooling. Since there is no save feature yet, there will be a cheat code to add enough money to your bank account so you can try out all the upgrades. I tried to model the turbo simulation like an actual turbo, where power from the engine goes through a feedback loop and there is a short delay until that power is delivered. You don't upgrade the engine torque entirely, but rather the pressure level where the turbo is capped. The final level can actually make the car so fast that I needed to implement an engine limiter at 260kph, otherwise it would just keep speeding up! I know this might be annoying but it was meant for the cooling upgrades, which are also available in the Career Mode update. These will allow you to make those long trips across town driving like a maniac! Upgrades are not available on the Shareware demo, but there are still some new features for free players. The Arcade Mode does feature the new turbo model, although only with the first upgrade level. 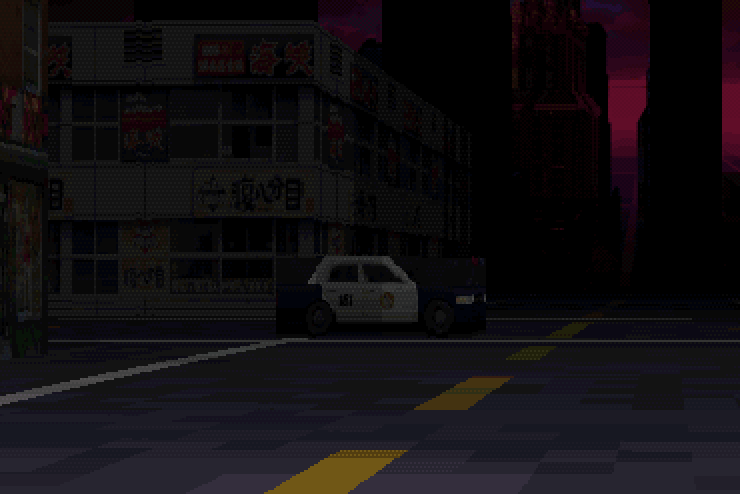 A new dithering filter on the color shading also brings a new mood to the game's presentation. Further updates will also come to the DOS HUD, which currently sports a miniature version of the full-resolution dashboard and doesn't show all important info. I would like to also get a minimap working on DOS if it doesn't impact performance too much. Thanks for the support and stay tuned! Early Access Release v0.2 now up!